Northern Trust is currently providing accounting services for select clients that have a small portion of their assets in cryptocurrencies. Northern Trust is exploring a way to hold and secure digital assets and cryptocurrencies for its hedge fund clients. The 129-year old Chicago-based global custodian currently does not have a custody services for digital assets, but it is something Northern Trust’s technology team would be willing to develop. “As part of our market advocacy and technology innovation process, we are exploring the potential for safe, secure custody of cryptocurrencies and digital assets, but this is not imminent,” said Justin Chapman, global head of market advocacy and innovation research, Northern Trust. “This is similar to services we perform for other esoteric holdings such as tangible assets or physical commodities. The client reports their ownership of an asset and its valuation, and Northern Trust records it so that our reporting reflects the client’s entire portfolio,” Chapman added. Individuals and institutions that hold cryptocurrencies are making custody arrangements through a range of smaller providers, such as crypto exchanges. In addition, the bank does not provide services to funds that focus on cryptocurrencies as a primary investment strategy. In a recent interview with Bloomberg, Peter Cherecwich, head of Northern Trust’s corporate and institutional business, explained it is developing a way to secure digital assets held in currency while seeking to charge lower fees than existing crypto custodians. Exchanges such as Coinbase and BitGo, which provide crypto custody services, currently charge a 10 basis point monthly fee and a setup cost of $100,000 for crypto funds. Chapman explained he is monitoring the regulatory environment before building out a substantial custody solution. 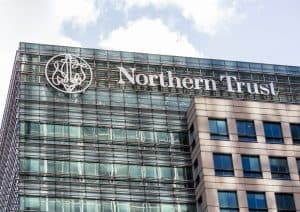 “Northern Trust will not offer custody services for crypto assets until there is more clarity globally from governments and regulators regarding classification, market practice and taxation,” said Chapman. Hedge funds are deemed to be at the front of the line when it comes to institutional involvement in cryptocurrencies, the main barriers to widespread adoption among traditional funds are lack of regulations, infrastructure and services such as prime brokerage. Earlier this year, Nomura announced it would be the first bank to launch a crypto currency offering through a partnership with Ledger, a security and infrastructure provider for cryptocurrencies, and Global Advisors, a bitcoin-specialist investment manager. State Street had also signalled an interest in expanding custody and fund administration services for the crypto fund market, however it said at the time demand from clients was relatively small.